3 Scart input sockets, 1 scart output socket plus 6 RCA phono sockets for audio/video. RGB connections on all 3 scart input sockets. Allows you to watch one source whilst recording from another. Compatible with VHS, DVD, Video 8, Hi-8 and RGB. 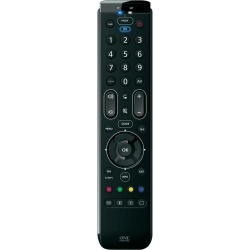 The One For All URC 7110 Essence TV Universal Remote Control is the ideal TV replacement remote control. The URC7110 Essence1 offers a very wide 160-degree angle of operation, which makes it possible to operate the remote at just about any angle. One for All Simpleset codeless setup gets the remote and your TV up and running in just three steps. To set up your TV brand, simply Press the Magic button, select the device you wish to set up, and press a digit key to set up your respective brand. The handy One For All URC 7110 Essence TV Universal Remote Control works with all brands. Watch and control your digital satellite from any television with this ingenious ONE FOR ALL Sky 150 tvLINK. The Sky 150 tvLINK sits on top of the television in your bedroom, office or other remote viewing point and sends remote control signals to the SKY digital receiver in the lounge through the same coaxial cable that delivers SKY pictures to your main TV. Simple to install, all you need to do is to pick up your remote control and the ONE FOR ALL Sky 150 tvLINK gives you the freedom to channel surf from the convenience of any of your preferred TV watching location! 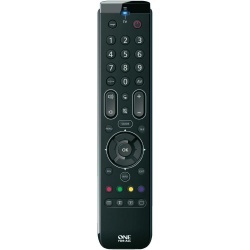 The URC7120 Essence 2 Simplified Universal Remote offers easy control of your digital TV content, for satellite or cable. Features include Combi Control, so you can operate your TV and set top box as if they were one device. 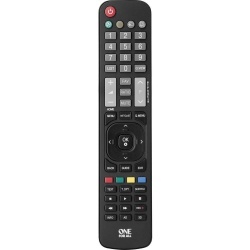 The One For All SKY101 Sky Remote Control is a direct replacement remote control, in case you lose or break the original that comes with your Sky box. This simple-to-use replacement for SKY Digibox and television remote controls offers full function sky controls, and will control both digibox and television at the same time. The SKY 101 Remote Control comes pre-programmed, and with batteries included. The only true Philips replacement remote. No Setup required. Supports all common Philips functions like Browse Menu, Home and Ambilight. Multi Menu Centre Island. Learning feature allows you to customize your remote to your needs. Supports all Philips TVs including Plasma, LCD and LED models. The Essence 3 is the ideal universal remote to control all your equipment without switching between device modes. You can now Control your TV and set-top- box as if they were one. No more switching between different remotes. The Essence 3 operates TV, LCD, Plasma, SAT/CABLE/ DVB-T, Freeview, DVD, Blu Ray, up to 3 devices and comes with a stylish white back. An integrated 160 degree infrared lens makes it possible to operate all Essence universal remotes at just about any angle. Control your TV and set-top- box as if they were one. The automatically installed CombiControl button allows you to control the TV volume and your set-top-box channels without having to switch the One For All® remote’s control mode, let alone switch between two different remotes. Just 3 steps to set-up your device. Set-up your brand in under 30 seconds: Press the Magic button Select the device you wish to set up Press a digit key to setup your respective brand. This simple-to-use replacement for SKY Plus and television remote controls offers full function sky controls, and will control both Sky Plus Box and television at the same time. The SKY Plus remote control comes pre-programmed, and with batteries included. 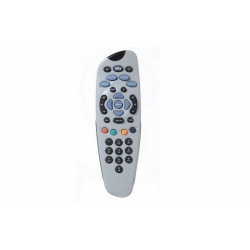 This simple-to-use replacement for SKY HD and television remote controlsoffers full function sky controls, and will control both Sky HD box andtelevision at the same time. 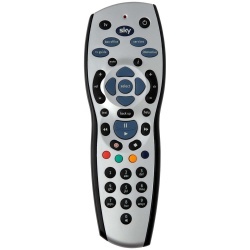 The SKY HD Remote Control comes pre-programmed, and with batteries included. The only true Panasonic replacement remote. No Setup required. Supports all common Panasonic functions like Link, Tools and Guide. Hard cap navigation ring. Learning feature allows you to customise your remote to your needs. Perfect for replacing a lost or damaged remote, the One for All URC1910 Samsung Replacement Remote Control can help you to take control again. The URC1910 Samsung Remote Control is compatible with all Samsung TVs, so you won't need to spend time hunting for the exact remote for your TV. There is no setup required, and it can be used to control common features such as SmartHub, HDMI and menus. The learning feature allows you to customise your remote to suit your needs. With guaranteed compatibility for your Samsung TV, control over your television is easy with the One for All URC1910 Samsung Replacement Remote Control. 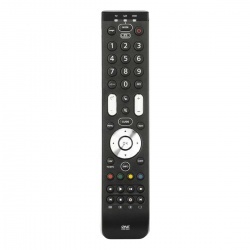 The One for All URC1912 Sony Replacement remote control is ideal for replacing a lost or damaged remote, enabling you to use all your TVs features again. The Sony remote control is compatible with all Sony TVs, so you won't need to spend time hunting for the exact remote for your TV. There is no setup required, and can be used to control common features such as theatre, I-manual and options. Works just like your original LG remote control. Ready for use as soon as the batteries are inserted. Functions: volume control, mute, power, menu, teletext, AV, Q.Menu, Netcast, T.OPT, Q.View, exit, back, OK, AD, 3D, input, movement keys such as Play etc. The ergonomic design, the shockproofing and it's ease of use makes the Simple 3 a real family remote. This universal remote control is developed to tackle consumer demand for easier set-up and interactivity with your digital TV, set top box and other media devices. The Simple 3 operates (HD)TV, Projector, LCD TV, Plasma, SAT/CABLE/ DVB-T, Freeview, IPTV, DVD, Blu-ray, and many more, up to 3 devices. It is available in gloss black. Do away with the confusion of too many remote controls in your living room when you consolidate control in a single convenient One For All URC7140 Essence 4 Universal Remote Control. Operate up to four devices at once at a range of angles of up to 160° with the URC7140 Essence Universal Remote Control to simplify your command of TV devices, regardless of where you're positioned. 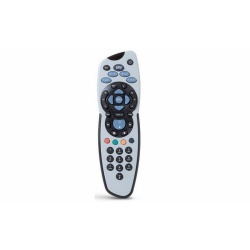 This versatile remote also boasts an impressive range of up to 20 metres. Even more impressive is the ease of set up as the URC7140 Essence Universal Remote Control is able to learn from your original remote - just copy functions across to the keypad to retain the functionality you've always had. 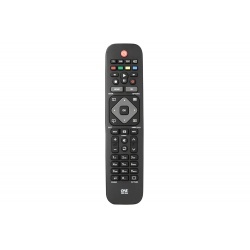 Give yourself a break from fumbling for the correct remote and set yourself up for stress-free television watching at the click of a button with the eminently practical, One For All URC7140 Essence 4 Universal Remote Control. Get started with High Definition LED TV and discover what it means to enjoy high-quality films and TV shows, action and sports. Thanks to the built-in USB terminal, you can also easily enjoy your photos, movies and more in comfort on the screen. Content stored in a USB memory stick can easily be played back on the screen. A wealth of customization functions let you add background music and effects. Walker 24 led saorview tv. Live pause and record ready. 7 day rte program guide. Usb with media play & record. Pc in via hdmi and vga. Walker WP2213LEDVD 22" Ultra Slim LED/DVD TV Combi is a stylish, feature-rich LED Combi TV is ideal for those looking for a full HD set for a bedroom or kitchen. The ultra-slim design allows for discreet positioning, either on a wall mount (purchase separately) or on the pedestal stand provided. A whole new world of entertainment awaits you and it’s all just one click away. Choose from a huge range of music, video, TV and social media apps. And with Netflix® and YouTube™, you will find plenty of HD content. Sometimes once just isn’t enough when it comes to watching your favourite programmes and movies. With the USB recording feature, you can watch and record your favourite TV content. Experience the kind of audio that you would normally expect to hear in a cinema. Enjoy authentic-sounding dialogue and hear more of the on-screen action thanks to Dolby Audio™. Share your most precious memories. Display photos from your smartphone or tablet on your new Toshiba TV.